We've all experienced that noisome, bitter stench while waiting on a mainline train station. After moving away from the chain coffee stall, it tends to go away. 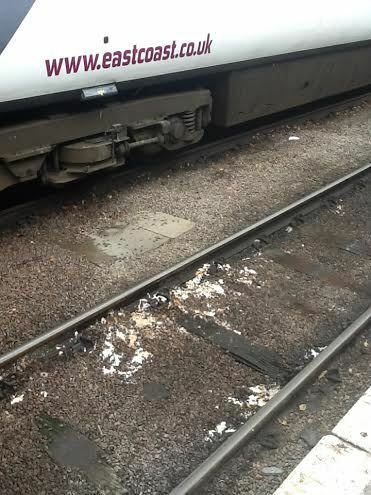 But then there's that other source of unwanted emanations: wee and poo dumped on the train track. East Coast denies that its cleaning staff are flushing toilets at King's Cross and says that passengers are urged not to do so either. Yet the problem persists. It's not just a nose-pincher for those waiting on platforms. The RMT union is now agitating about the problem, describing the effluent as a health risk for its track workers. Union leader Bob Crow told the BBC: "I think it's absolutely scandalous. No other part of society would allow for raw sewage to be thrown over the track where our members have to work". The union is calling on train companies to invest in containment systems, while both the government and the Rail Delivery Group reassure us that they are investing in new rolling stock. Complete fleet replacement will take years, however. Until then, please mind the crap, and don't flush in stations. What's the scale of this problem? Have you encountered the telltale whiff of raw effluent on one of London's mainline stations? Dish the dirt (not literally) below.